The NCAA's musical chairs act of the past two years have seen big shake-ups as major college football schools moved from one conference to another. For the most part, the Big Ten Conference led the way, adding Maryland, Rutgers and Nebraska to the itinerary, and the new divisions will change how Ohio State Football and other D-I programs operate. 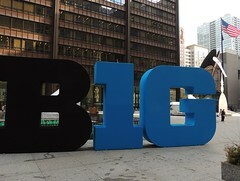 Instead of the Leaders and Legends divisions that were formed in 2011, the new Big Ten Conference will be divided geographically with the West and East divisions. In the East division of the Big Ten Conference, the Ohio State Football program will share the ranks with the Indiana Hoosiers, the Maryland Terps, the arch-rival Michigan Wolverines, the Michigan State Spartans, the Penn State Nitany Lions, and the Rutgers Scarlet Knights. In the West, the Illinois Fighting Illini share a division with the Iowa Hawkeyes, the Minnesota Golden Gophers, the Nebraska Cornhuskers, the Northwestern Wildcats, the Purdue Boilermakers, and the Wisconsin Badgers.